PLANO, TX--(Marketwired - December 12, 2017) - Torchlight Energy Resources, Inc. (NASDAQ: TRCH) ("Torchlight" or the "Company"), today provided an operational update on its projects. To date the Flying B Ranch #3 has attained a highest measured production rate of 465 BOPD and 248 MCFPD of gas as the well continues to clean up with 45% of load water recovered. Torchlight reports continually improving oil cuts as high as 30% and over 12,000 barrels of oil produced thus far. The recent production rates are comparable to other Midland Basin Wolfcamp A wells with 5,000 foot Laterals and on par with Torchlight's expectations for the well. Permanent production facilities are being installed and the Company is negotiating to market any gas not used for operations. A new well in the Hazel Project, named the Flying B Ranch #4, was permitted, drilled and reached vertical total depth as outlined under the Company's lease requirements. Torchlight plans to continue to weigh the production data from the Flying B #3 before deciding on which zone to target for a horizontal objective in the well. The well configuration is set up for a 7,500' or 10,000' lateral to be drilled after evaluation. Torchlight confirmed that it's horizontal development thesis has been proven in the Hazel asset and is planning to enter the next phase for the project. Along with operational planning, the Company will be considering reserve potential and multiple scenarios for entering development at the lowest available cost of capital. Torchlight's next Orogrande Basin Project well, the University Founders A25 #1H has been spud and the Company is currently preparing to drill below intermediate casing at ~3,000 feet. The wellbore design is such that the casing size is sufficient to allow Project Geologist Rich Masterson to acquire all necessary scientific data, cores and sophisticated well logs to identify an entry point for the lateral section and proper isolation of zones behind pipe. Management recently documented progress during a field visit to the Orogrande Basin Project and that media is available from the Company website at www.torchlightenergy.com. Torchlight and McCabe Ventures continue to hold discussions with potential industry partners suitable to move the project into development. Torchlight currently holds a 67.75% working interest in the highly prospective 133,000-acre play. The Company expects that its recently announced Delaware Basin Project with McCabe Ventures and MECO IV, LLC will provide for 20 new, 10,000-foot extended reach lateral well locations in an area of Winkler County, Texas close to significant peer group activity. The lease is well situated for long laterals and nearby wells have produced significant total reserves per lateral well bore. Torchlight expects to begin operations on this Project by Second Quarter 2018 and is carried for the first well by MECO IV, LLC under the terms of the purchase and sale agreement. "We are pleased to demonstrate meaningful horizontal production in the Wolfcamp A section of our 12,000-acre lease," stated John Brda, CEO of Torchlight. 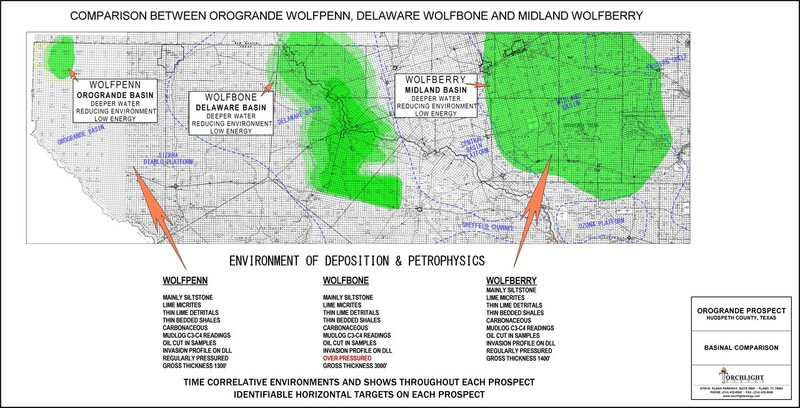 "We expect that this asset will be developed employing extended laterals of up to 10,000 feet in length providing Torchlight with between 30 and 100 new Wolfcamp A well locations alone, depending on spacing. With only one productive horizontal bench of three we have seen and targeted in this field, our total number of supported horizontal locations could be well over 200 in total." Brda went on to state, "Our recent success in the Midland Basin Hazel Project is a testament to the knowledge and technological expertise that Rich Masterson, Greg McCabe, and Scott Kimbrough bring to our team. We look forward to applying the same experience in our Delaware Basin asset and most importantly, to the proving up of our Orogrande play. Our technical team has in depth knowledge on how to discover and produce out of new plays and pay zones. This is exemplified by the original development of the Wolfbone by Rich Masterson which today is a well-known and highly productive play. We are currently in the process of observing a similar development as part of our Hazel play. In addition to the Orogrande and Delaware Basin acreage, Torchlight is well positioned to deploy technology and know-how into additional assets it continues to evaluate for partnerships and acquisitions. We are excited to accelerate our growth through the drill bit and corporate strategies."